the American Association on Intellectual and Developmental Disabilities—to market its memberships and renewals, books, journals, training programs and more for over a decade. To see what keeps that level of relationship strong for so long, check out the focus of this email. 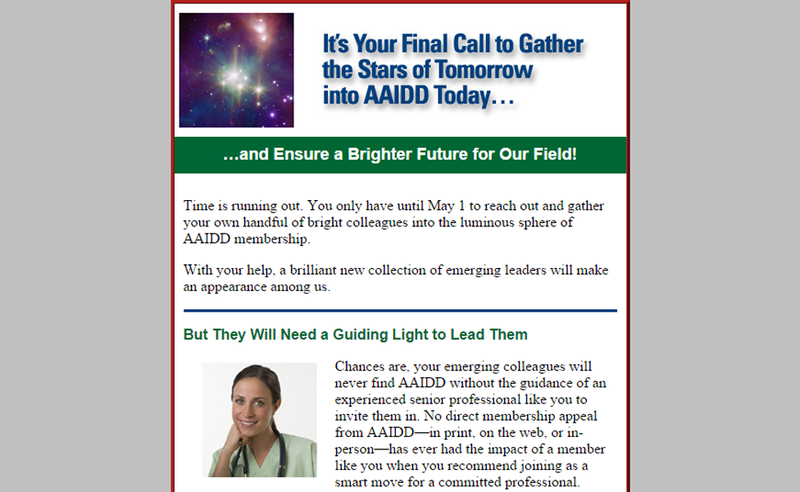 Its market is long-time members who want AAIDD to endure, and the message is: When leaders like you recommend AAIDD membership to the rising stars on a staff, they respond with enthusiasm. That reality has been revealed by many tests. Yet even such a sensible message must be sensitively stated to inspire the emotions that lead to action.